Urethane Molded Parts ? You’ve come to the right source! Urethane Mounting Blocks: Urethane mounting blocks are non-marking and will absorb noise and help reduce harsh slamming from equipment. Being able to cast urethane mounting blocks to size allows Plan Tech to supply high-quality mounting blocks with any profile or detail needed for any custom urethane molded parts application. Urethane Stop Cushions: Urethane stop cushions are extremely common in machine shops and used with automated equipment due to urethanes ability to absorb an impact and return to its original shape even after years of repeated abuse. 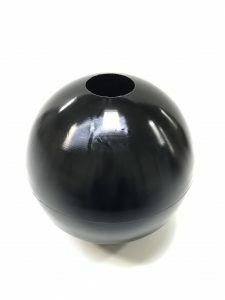 Custom cast urethane stop cushions are available in any profile for the application and are commonly supplied in a 60A to 95A durometer with a variety of additives available to enhance the physical properties of the urethane molded parts. Polyurethane Flywheel Fans: Polyurethane flywheel fans are essential for keeping equipment that generates heat cool. Urethane is a great choice when looking for a replacement cooling fans for antique equipment or in high demand applications. Urethane will hold up to repeated abuse at any given rpm and has a temperature range from -20 to 170F degrees. Custom polyurethane flywheel fans are a great way to take any ideas or sketch to real urethane molded parts. Working with our team of engineers we can design any fan blade type. Common polyurethane flywheel fans profiles have bi-directional air movement allowing cool air to move whichever direction the fan it is spinning. Urethane Rub Strips: Urethane rub strips also reduce vibration with a long service life due to additives like Armorglide and Molly oil that is mixed into the urethane material evenly. High strength or bolt-on applications often times have a steel insert or bar molded into the rub strip for added strength as a medium hard durometer is recommended for maximum service life and vibration control. Urethane Hole Formers: Plan Tech Armorglide Urethane Hole Formers and Liners offer increased abrasion resistance; better tear resistance and a reduced coefficient of friction. This allows a better release of sticky or viscous materials. Urethane hole formers are offered in standard sizes and may also be cast to your custom urethane molded parts specification. 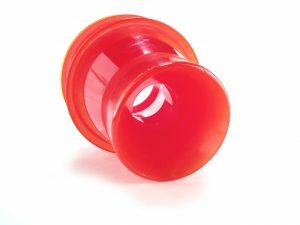 Urethane Plugs: Urethane Plugs are one of the critical urethane molded parts that Plan Tech manufactures. 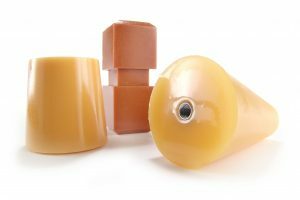 We are a large supplier of high-quality custom cast urethane plugs that solve industry-wide challenges in many markets such as medical, automotive, electronics, hydraulics and more. Urethane plugs help manufacturers indicate parts that look similar or to mark which direction a gear should rotate during production. 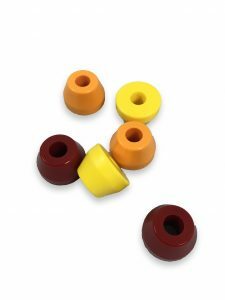 Urethane plugs are also commonly used to temporarily fill machine parts during shipping or assembly to keep any contaminants out. Urethane Coated Cam Followers: Urethane coated cam followers are cast using high-quality resin from world leading chemical and polyurethane suppliers. Coating cam followers with urethane requires a higher level of molding process than covered bearings. Urethane Crossover Pads: Urethane crossover pads are an extremely common item to find at construction sites and moving venues like fairs and concerts. Frequently you will find urethane crossover pads in new construction of homes and commercial businesses. Urethane crossover pads will be placed over electrical wires or cables to protect the person or equipment from tripping or getting entangled with the wire when crossing. Urethane Feed Cones: Polyurethane is an impact-absorbing high wear resistant material and works great for urethane feed cones. It is ideal for transferring material such as pulp and paper, sand slurry or any other abrasive compound. Urethane feed cones can even outlast stainless steel in this type of application. PlanTech can line existing parts or mold complete assemblies for urethane feed cones or any industrial urethane molded parts application! Urethane Jacketed Check Valve Balls: Urethane jacketed check valve balls are cast from high-quality hot urethane providing the maximum service life in the most extreme and harsh conditions. At Plan Tech we supply urethane jacketed check valve balls for all different applications and are available in a variety of hardness. The most common industry requiring precision urethane jacketed check valve balls is waste-water treatment plants. Urethane Drive Belts: Larger size urethane drive belts will be molded to size from tooling designed and produced in-house. Often times Plan Tech can prototype urethane drive belts and turn to high volume in just a few weeks! FDA approved formulas are also available with a variety of additives to enhance the physical properties of our urethanes performance. Urethane Hydrocyclones: Urethane hydrocyclones are a custom molded part to meet OEM specifications. Made from a tough urethane our urethane hydrocyclones can be a variety of colors with additives that will increase abrasion resistance. Urethane molded parts are commonly found in gas and oil drilling applications and are used to separate particulate from liquid or slurry solutions. Urethane Sand Spreaders: Urethane sand spreaders feature high-performance polyurethane. We have the unique ability to tailor our physical properties of the raw urethane materials that are being utilized to produce a superior line of custom urethane sand spreaders for snow and ice control equipment. A variety of additives can be added to enhance wear properties, add lubricity, UV stabilized, flame retardant, or to reduce static build up for urethane molded parts. Urethane sand spreaders have been used by airports, state highway departments and municipal road crews. Urethane Die Springs: Urethane die springs are a critical piece for the operation of die cutting where corrosion, vibration, or magnetism prevents the use of conventional steel springs. Urethane die springs are used to replace conventional steel springs which can fracture in operation and cause possible injury to machine operators. Advantages of urethane molded parts include non-marring springs that are quiet and handle higher pressures than conventional steel springs. Urethane Forklift Covers: Urethane forklift covers are used in the building and construction industry. The construction industry in the United States is the largest market for urethane products. Urethane building products perform countless tasks from the floor you walk on to cabinets from slamming when closed quickly. Urethane has also helped keep older construction equipment running by being able to produce replacement urethane molded parts that were once thought of as discounted or not available. Polyurethane Drive Bands: Polyurethane drive bands are available in FDA formulas in any hardness. Most polyurethane drive bands are of a soft hardness to increase traction on pulleys and the material it will be processing. Cast from high-quality polyurethane material our drive bands will absorb an impact and return to its original size in any environment. Urethane drive bands have a working temperature of -40F to 175F for maximum service life. Urethane Conveyor Skirting: Urethane conveyor skirting and bumpers are custom cast at Plan Tech with rapid turn around. Often times we are approached with a unique challenge and with our molding experience and services like water jet cutting we can produce urethane conveyor skirting with no startup or tooling cost. Polyurethane Screw Shoes: FDA polyurethane screw shoes are also available in all hardness suited to be FDA dry food complaint. New or old applications Plan Tech is ready to produce polyurethane screw shoes for any machine or applications with a rapid turn around on new orders. Polyurethane Roller Belts: Polyurethane roller belts are used in many different applications and are most commonly found in assembly factories to label or drive product down to the next process. 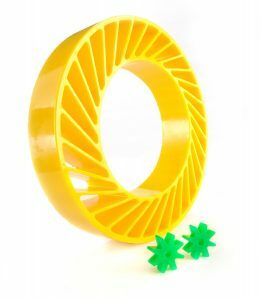 Urethane molded parts can easily molded and machined to create any size or durometer polyurethane roller belts with rapid turn around. Most roller belts do not require any tooling to get started can be produced in a few weeks. Any hardness or color is available at Plan Tech with rapid turn around. Urethane Wheels Chocks: Urethane wheel chocks are critical safety equipment in mining, industrial and aviation environments because they ensure that lives are protected with their proper and sustained usage. Long-term cost savings and superior on-site visibility are the other reasons why urethane wheels chocks are better than any other industrial urethane molded parts available on the market. Urethane Chute Liners: Urethane chute liners are offered custom manufactured to help solve wear related issues. Plan Tech’s urethane chutes liners are the perfect solution for offering protection against chutes from abrasive compounds and metal hoppers. These are just a few of the custom urethane molded parts that we manufacture. Urethane starts as a prepolymer and a variety of polyurethane additives can be incorporated that can enhance the desired physical properties of custom urethane molded parts. Once the urethane resin is processed the liquid urethane will be poured into a heated mold where it will cure overnight to produce high-quality replacement urethane molded parts. Urethane Molded Parts are a great choice for material because it is capable of handling extreme loads; urethane will also help absorb vibration and shock. 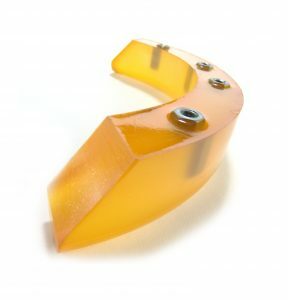 Plan Tech has been manufacturing new custom urethane molded parts for over 30 years! Some common urethane molded parts that we manufacture have a 75D durometer hard inside diameter that is chemically bonded to a softer outside surface. Please Contact us so we can discuss your Urethane Molded Parts application!